Stiff erect shrub with stout branches. Thick pale green toothed leaves, are densely clustered on the stems. The flowers are the largest flowers on any Hebe. They are pure white and resemble many beautiful white cups. Flowers in sumer. 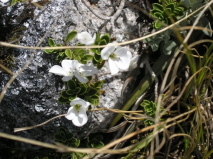 It occurs naturally in Northern South Island, in penalpine grassland or low shrubland. It is best grown in a sunny site, with good moisture. Hardy to cold. Grows in sun or semi-shade / Prefers a sunny site / Tolerates exposed sites. / Will tolerate very hard frosts.